More often than not, when on the road we like to search for that hidden gem that will make the trip an unforgettable experience. Sometimes we just explore the area and take our chances; sometimes we take a map and plan ahead. And that’s how we found Erice while wandering around Sicily, hidden in the west corner of the island, on a hilltop by the sea in the outskirts of Trapani. So there we were, driving along the almost impossible winding south route in the late evening, up the hill and closer to Erice with every hair-raising sharp turn: left, right, a short straight stretch and left-right again. The lights of Trapani were already shining brightly in the distance -almost too far for the naked eye to see. But we were getting closer to darkness, always up the hill. Finally, some signs of civilisation, a barking dog in that lonely house, a dim street light by the bumpy road and a sign: Erice 1km! Just one more kilometre of left and right, left-right and up into the thinning clouds, with the night air cooler at every turn. And at last there we were, in front of Porta Trapani -the South Gate of the town walls, waiting under the Sicilian autumn night sky for our hosts to come and pick us up in a smaller car, since ours was not a match for the narrow streets of the citadel. 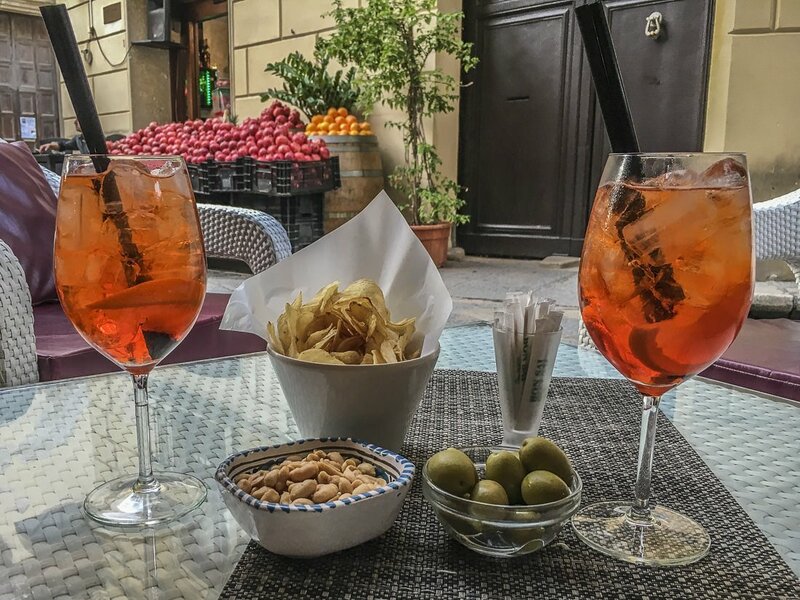 We had booked a couple of nights at Residence San Martino and oh boy wasn’t it the best decision ever. Several cute apartments arranged around a beautiful inner courtyard, with that feeling of timelessness that only small towns can boast of. We couldn’t believe that little piece of secluded heaven would be our home while in town. 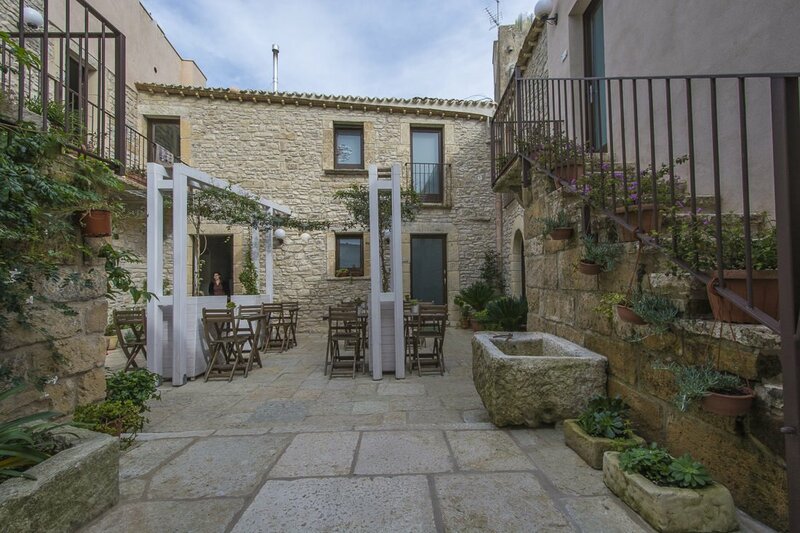 Apparently, so we were told by our host Maria Elena, courtyards like this were the centre of social life in the old times all around Sicily, where neighbours met after their daily errands to share a quick coffee or a glass of Marsala wine while the kids played together. It was such a romantic idea for modern standards, these old walls had heard so much gossip and witnessed so much friendship. The next morning it was time to explore Erice. That would be after a simple but energising Italian breakfast of pastry with a side of cappuccino in our apartment, with an open window and the crisp morning air flooding the room. With half-full bellies we embarked on our mission for the day but not before learning a much-appreciated lesson. 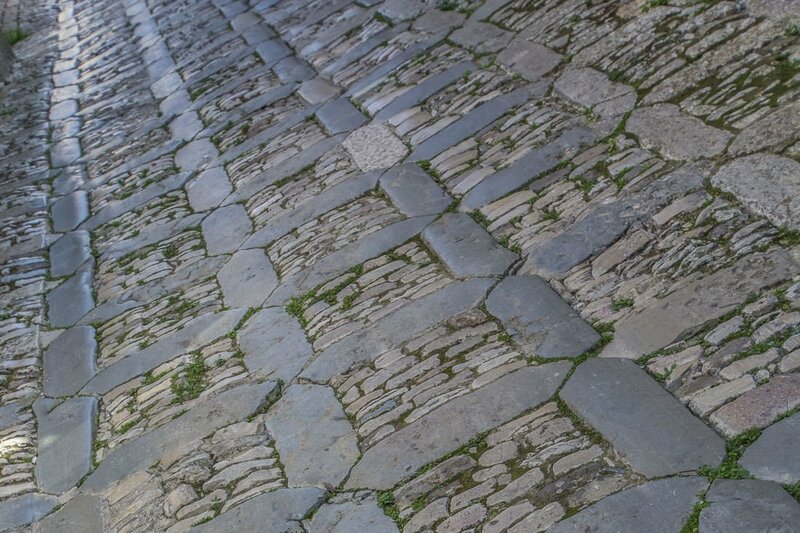 The old streets of the town centre are paved in weather-polished cobblestones that, as you can imagine, do not give much of a grip when wet with the morning drizzle. Anyway, after what could have been a couple of very comical and embarrassing situations, we were all ready to go. By mid-morning, however, the otherwise quiet streets of the bucolic old town quickly fill up with tourists that arrive in busloads or by the public cable car, paradoxically searching for peace and contemplation. …Wait a minute! A cable car you said?! No, I didn’t go nuts here. 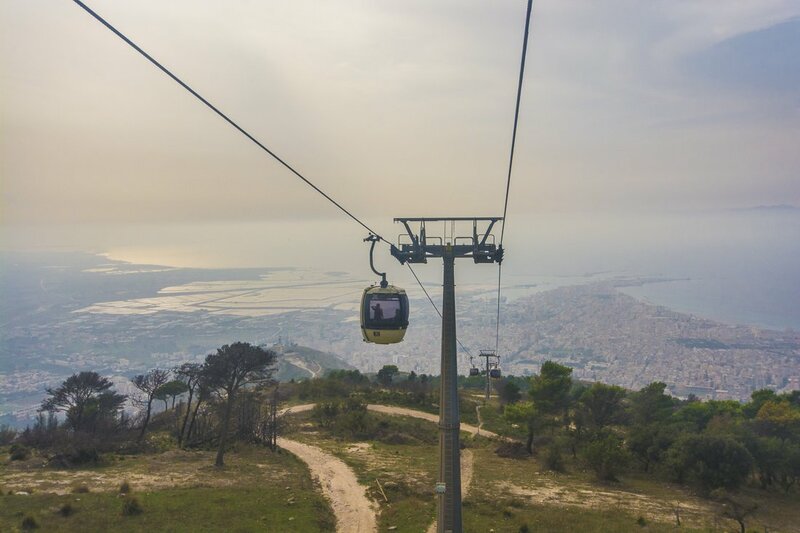 A cable car will take you from Trapani to Erice in less than 10 minutes, as quick and comfortable as it sounds. I bet you were not expecting that here, right?! Anyway, more about the cable car later, back to Erice’s peace and contemplation for now. There are other reasons why visitors come up here. Though less spiritual reasons even if some claim they are food for the soul, pastries. Sweet and delicious pastries of all sorts. But are Erice’s pastries worth the climb and the waiting lines out of the pasticcerie? We were ready to find out for ourselves, our stomachs already roaring a couple of hours after our meagre breakfast. After standing on a surprisingly fast line for a few minutes out of Pasticceria Maria Grammatico -the most renowned in town even if you cannot go wrong with any other pastry shop in Erice- it was finally our turn to be served. Not knowing what to pick out of the mouthwatering display, I went for a curd-filled Genovese and Michelle for a couple of cute-looking almond pastries. Everything washed down with a couple of glasses of sweet almond-infused Marsala wine (yes, wine before lunchtime, you gotta love Sicily) and served on a table facing east, with the morning sun warming up our faces while the strong wine warmed up our bodies. In case you expected otherwise (I mean, seriously? ), I have to say the Erice pastry claim is now confirmed. You can climb up there only for the pastries and no one will raise an eyebrow at it. You are welcome. Time to hit the streets again to confirm another claim: the best spot in Erice for the most spectacular views of the area is the Venus castle (Castello di Venere in Italian), and everyone in town seems to agree with it. That one was easy. The Venus castle is the highest point in town, built by the Normands in the 12th century hanging over a cliff facing north, over a former Roman temple dedicated to the goddess Venus, also used by Greeks, Phoenicians and Elymians before them. That’s how long Erice has been up there. The views? Gorgeous of course, judge for yourself and let me know! And while you’re up there and done with the views, you might be lucky enough to meet this talented guy. Now yes, let’s clear up the mystery of Erice’s cable car. 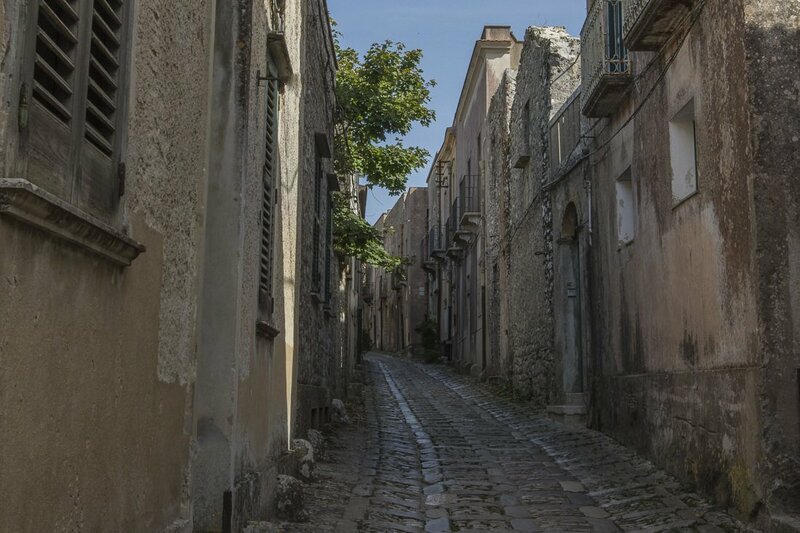 From the moment that we arrived in Erice we knew we had fallen in love with the place. However, our travelling spirit was already compelling us to explore Trapani at some point, even if only for a few hours. And so we did, down to Trapani by the cable car for an early afternoon Italian-style aperitivo. At some €10 for the round-trip full-price ticket, it might sound a bit like a rip off to go for an aperitivo. But, remember the Venus castle and it’s best views in town? 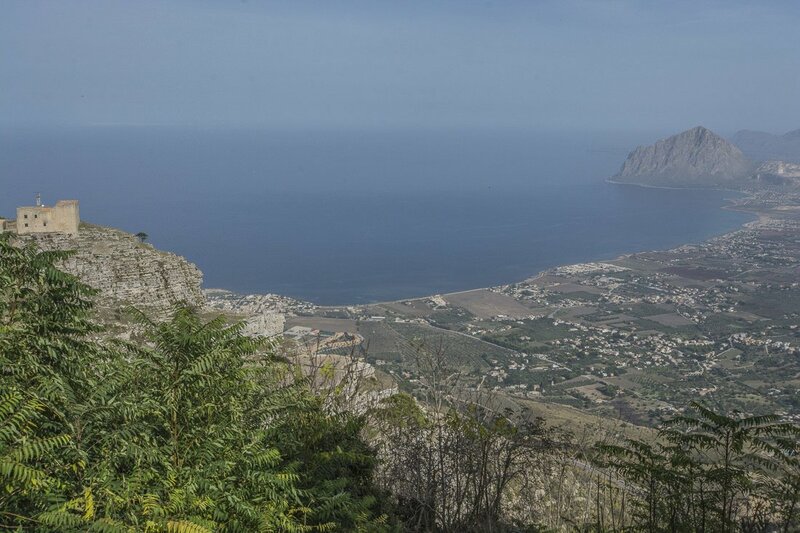 Well, the views you’ll get during your ride downhill are second to best, with the crescent moon coast of Trapani leading your eyes first towards the old town and later to the salt flats of Nubia. Also, on a clear day, you’ll be rewarded with a view of the Egadian islands cutting their silhouette against the glittering Mediterranean sea. Isn’t that worth €10? Also, this will be the most convenient option you will have to get down to the old Trapani, a gorgeous day trip packed with lovely views, delicious food and white-sand beaches. But this will be the topic of another post. Just remember the cable car does not run on strong winds, go and check their website to make sure you’ll not get stuck at either end. Our return ticket took us back to Erice at sunset, with the cobblestoned streets already clearing up and shop owners packing up for the day. I tell you, this tiny town is charming at daytime, but at night it puts a different type of beauty on display. The clouds engulfing the citadel again, the empty streets dimly lit up by shy spots of diffused light, the silence only broken by the odd catfight, the cold breeze,… as eerie as it takes to make one’s imagination run freely. But best of all, no one. Peace and quiet, so quiet you can almost hear your own thoughts. And for anyone with a camera and a thing for night photography, a playground with endless possibilities. 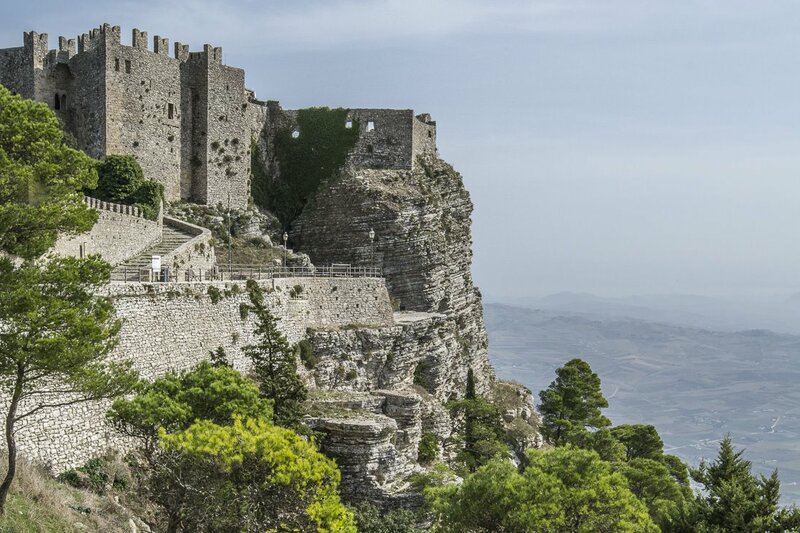 Erice is a Sicilian hidden gem you’ll not find unless you’re looking for it. And once you finally find it, you’ll immediately feel it’s spell. 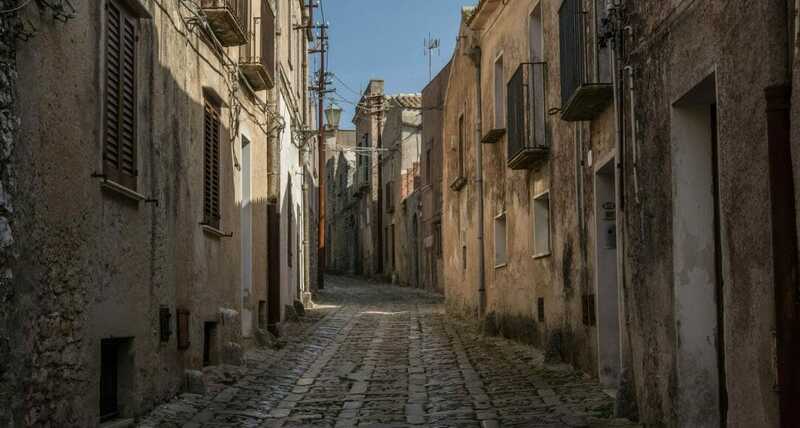 Two days within the walls of the citadel make you want to stay for a week, a week in Erice will surely make you want to stay forever. As in life, there is a time for over planned, adventure-packed travel and a time to slow down and start enjoying the simple things in a more unhurried way wherever you go. I really think Michelle and I are unconsciously and inevitably heading into that phase of life head first, and have already learnt to always take some slow time in each of our journeys to observe by-passers in a park, enjoy a glass of wine in the sun or indulge ourselves with a massage. And I have to admit it feels damn good. 7 Comments on “Erice, a Secluded Piece of Heaven Under the Sicilian Sky”. Join the Conversation Here! 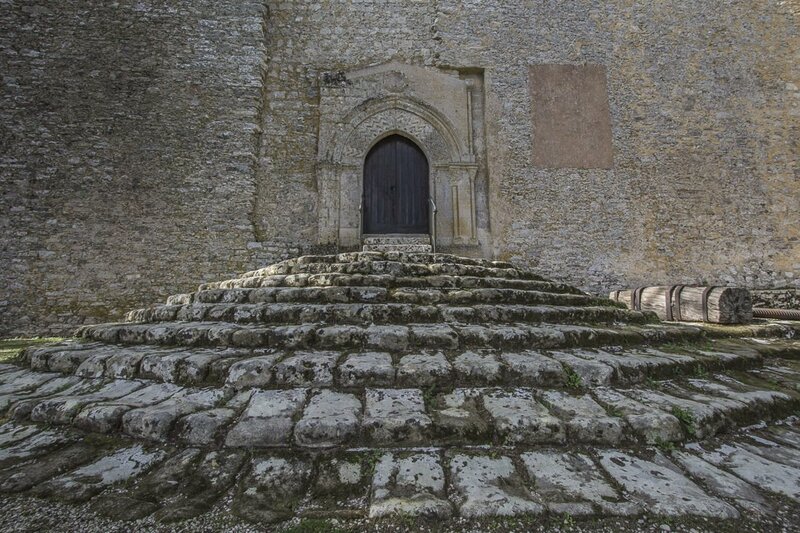 I really enjoyed this post of yours, thanks for sharing about Erice. I really love all of your photos and how informative this post is. Erice has lots to offer for the travelers like the food, the cable car, and lots of perfect views in town to capture and share to the world. 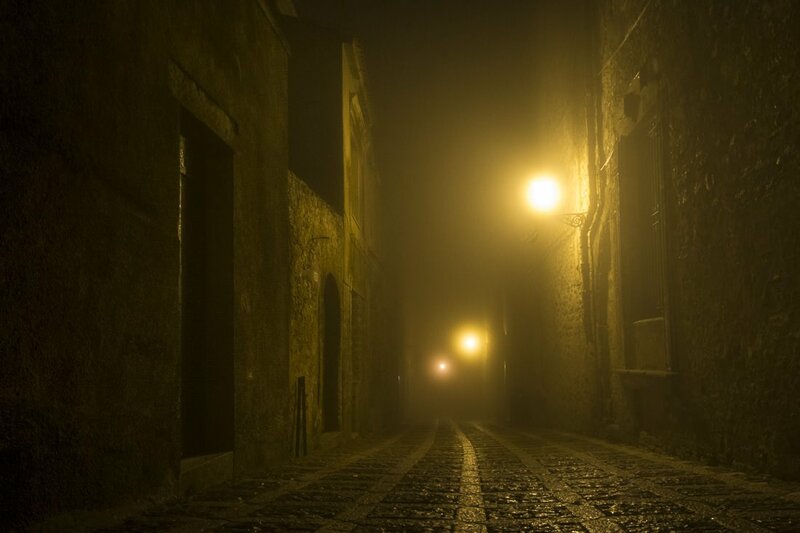 Erice at night is so perfect, I love how you captured that picture. Again, thanks for sharing! 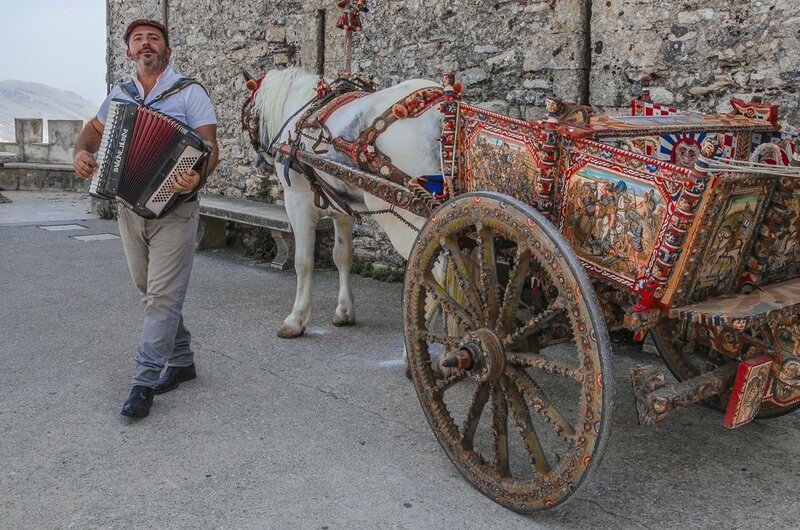 Hi Evan, thank you so much, Erice was a real surprise for us and can’t wait to go back next time in Sicily. amazing blog. i read complete blog. i like it. images is fantastic…..keep writing…. Hi Mukesh, thank you for stopping by. We post regularly, so stay tuned for more inspiring stories! amazing blog with best images sharing. i like your blog. thank you for best blog.